The Application Methods add-on allows selecting different job application methods on per job basis, users can enter one or more emails to which job application notifications will be sent, an URL to which the Apply Online button on job details pages will redirect or if you have LinkedIn integration configured allow users to apply using LinkedIn. To use the add-on download it using the link at the bottom of this article and install from wp-admin / Plugins / Add New / Upload panel. 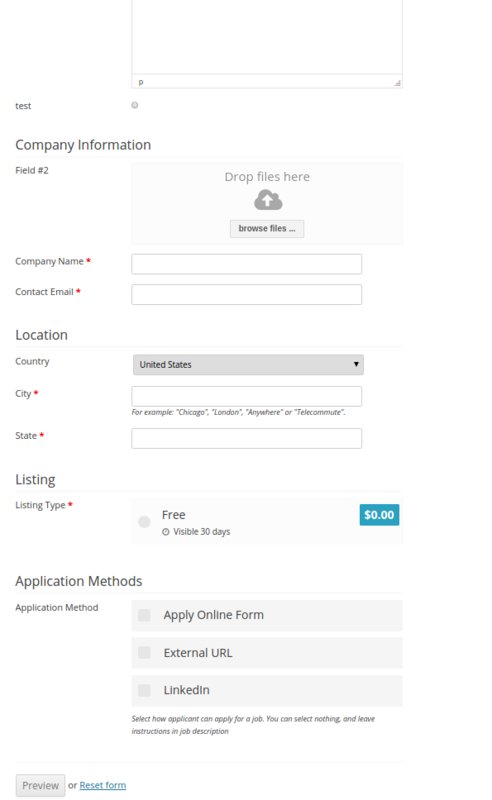 Apply Online Form: This method will display application form. Applications will be sent to all listed e-mails. You can add how many e-mails you want. It looks like in the image below. External URL: This method will display apply button, which redirects the user to an external page where the user can apply. It looks like this. 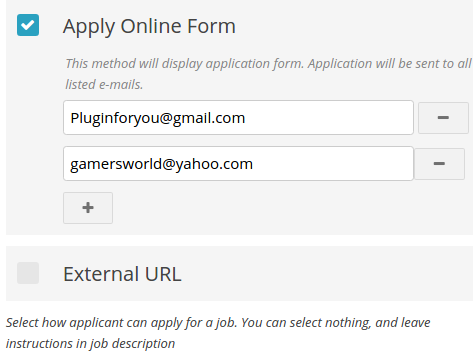 In the frontend users posting a job can also take advantage of the Application Methods, in the [wpjb_jobs_add] form the Application Methods will look and work similarly as in the wp-admin panel. You can download this extension from the Client Panel. Is there a way of customizing the text that appears on the button that links to an external application site? Currently it says “Visit Application Site” and I would like to customize that to say instead “Apply Now”. Yes, it is possible you can do that using a plugin like Say What? Please see this https://wpjobboard.net/kb/where-do-i-change-phrase-xyz/ article for more details.